This season finale was trailed as the 'Misfits' go public, but we ended up with a big cosmic reset button at the end and a characteristically downbeat finish. During the fame and fortune segment everyone gets done in by the homicidal jealousy of a kid with a really terrible superpower, “lactokinesis”. The gang complete their community service and go for a drink rather than embrace the fame and fortune that are teased earlier on in the episode. This episode didn't do a lot for me. The grand guignol quality of the episode – it's even more over the top than 'Misfits' usually is, with some very silly pointless gore thrown in – is quite engaging. But I'm not crazy about cosmic resets at the best of times and 'Misfits' hasn't shown that it can work with a status quo which isn't the Thamesmead community service. Apparently, season three is going to be much longer and have a more diverse group of writers – it's going to be “like 'Shameless'”, we're promised. 'Shameless' I thought went off the rails when its cartoonishness overwhelmed all compassion for the characters. I'm not sure we've seen anything to suggest that the existing anarchic but oddly gentle energy of 'Misfits' won't go the same way - I can imagine an episode bringing in Kelly's (Lauren Socha) family, for example, and just being vile (the big joke being that they all talk the same way as her). I hope I'm wrong. But as a season finale this one felt like a placeholder. 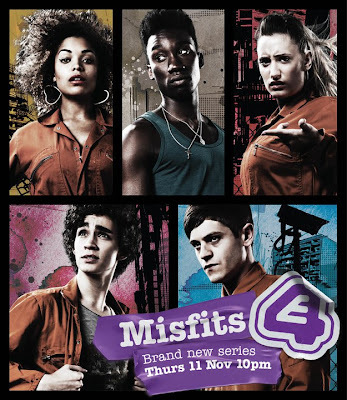 'Misfits' is available on 4oD for a limited time. UK users only. The first series is also available in its entirety.